WILLEMSTAD – Prime Minister of Curaçao, Ivar Asjes has established a working group, which will investigate what the impact of the current situation in Venezuela will be on Curaçao. The working group will shortly report its findings to the government and parliament. 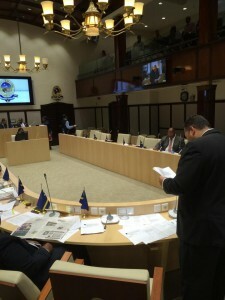 MP for the ruling party Pueblo Soberano (PS), Elmer 'Kadè' Wilsoe is awaiting these findings before he can substantively respond to the latest debate on the topic in the Lower House of the Dutch Parliament. This debate was held with the Dutch Minister of Foreign Affairs, Bert Koenders in response to the tense situation in the neighboring South American country. The situation in Venezuela is therefore being monitored within the Kingdom, that they will not be overtaken by any developments as a possible autocracy or a complete takeover. Both Wilsoe and Charles Cooper of the opposition party MAN emphasized that monitoring is a Kingdom affairs. Both MPs indicated that the Netherlands could not ignore the local findings and input from the islands. The reporting of the local working group will therefore have to be included as input. Wilsoe can imagine the worries of the Dutch parliament. The PS MP mentioned issues such as the freedom of the press, which is now in jeopardy and the humanitarian situation. The South American neighbor is camping with scarcity of basic items and people have to stand in long lines to get basic necessity products.